Since New Year’s Eve and New Year’s Day are about the only two days I actually take off, I spent some time adding entries on Autocade, a site that doesn’t seem like “work” to me. It’s my hobby. Morris 2200 (ADO17). 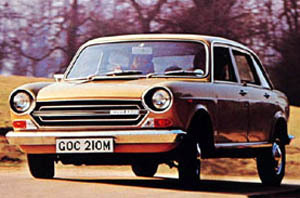 1972–5 (prod. 20,865, incl. Austin 2200). 4-door saloon. F/F, 2227 cm³ (6 cyl. OHC). Twin of Austin 2200, identical in all respects but badging. See Austin entry. Similar to Wolseley Six, on the same basis. Austin 2200 (ADO17). 1972–5 (prod. 20,865, incl. Morris 2200). 4-door saloon. F/F, 2227 cm³ (6 cyl. OHC). Development of Austin 1800, with larger E-series engine that had seen service in Austin Tasman and Kimberley in Australia. Good power from larger E-series, though cars were overshadowed by better Rovers and Triumphs. Twinned with Morris 2200 and Wolseley Six. Spot the similarity apart from the cars being basically the same? Both are of the 2200 in motion, wheels turned to the left, in ﬂight. One suspects that BLMC didn’t want people getting a look at the car while it was stationary, so the promo shots were done with the 2200 in anger. The E-series engine actually wasn’t that bad, but the car was hampered with those same-again looks from the 1800, and a bad driving position, compromising what would have otherwise been a pretty good package. The other lot that was of huge interest to me hailed from China. Frankly, you can’t do a car database of recent vehicles without including a large amount from the mainland. Yes, of course there will be consolidation, but at the same time we are looking at a large population, happy to buy local (as in cars from their own region), and somewhat reﬂecting the buying behaviour over in India. There, you see Hindustans in the north, Premiers in the south, and Marutis everywhere; China tends to have models that sell better in their home regions. Even Volkswagen ﬁelds two compact sedans in the Jetta class, in recognition of this. That was a tough area to research. In the past, I’ve put up some of the newer models such as the Chery A3, or the easy-to-follow remnants of the British Motor Corp. (MG and Roewe), but I began tracing the history of models such as the Geely Haoqing. Geely may be Volvo’s parent company but there’s not that much about some of its earlier models which were based around an ancient 1980s’ Daihatsu Charade. Hopefully, there’s now some decent info in the Anglophone web as a result of my work on this and half a dozen other cars which will seem mainstream to readers inside China, and totally foreign to those outside. I also had a Twitter exchange with the webmaster behind Carfolio, whose site is far more comprehensive than Autocade. His aim is to record every detail about every variant of every model line, and I don’t envy his task. Carfolio.com has been collecting and collating automotive technical data for many years, before actually having a website or even an internet-connected computer. Realising that there would be interest in this database, I decided to put my data up online in a very useful and functional way. It has always and will always be free for anyone to utilise. Some people, however, have decided to crawl the site and put all the data into their own database and resell and republish the information without attribution, credit or acknowledgement. Some go as far as to add 10mm to the basic dimensions so as to try and disguise their actions. The culprits are named on the Carfolio site, so, car anoraks, steer clear of them. After reading that warning, I added a small note to Autocade: you can take bits based around Creative Commons, but duplicating the entire site is a no-no. I know this goes against the idealism surrounding CC, but I would be horriﬁed if millimetres were being added to my hard work, and render it useless. A few oddball models were added to Autocade for the enjoyment and use of netizens, including the second Honda Z, the Daewoo Royale (of which there is little information, and what exists on Wikipedia is not wholly accurate) and the three Tridents (which I could not have done without reference to Keith Adams’s excellent AROnline site). Now that I’ve done my dash for a few days off, it’s back to my real jobs. Have a wonderful New Year.